Okay so after my Banana Bread made with the help of my Kenwood Chef, I've since got all tricky and made this Meringue Wreath. Now I understand that for most this probably isn't tricky at all but I don't do baking; simply because I'm no good at it. 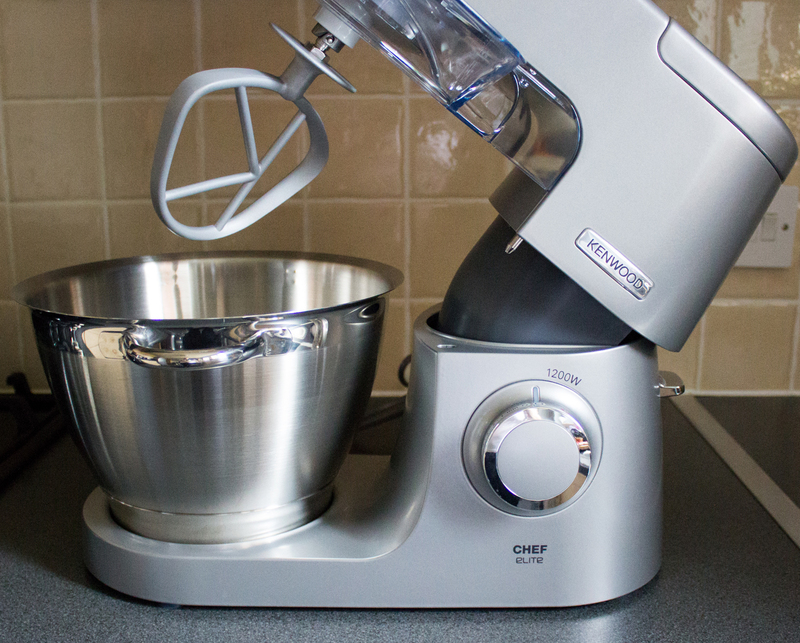 However, since the Kenwood Chef Elite arrived it's made such a difference as I not only love using it but it makes life so much easier. I really couldn't have been bothered with all the whisking needed to produce meringue (too much like hard work and I am lazy) but now I can just put the egg whites in and let it get on before adding the sugar a little at a time and let the Kenwood Chef Elite KVC5100S do all the hard work. In a cup mix the white wine vinegar together with the cornflour and set aside. To make the meringue, tip the egg whites into a the mixing bowl and attach the K Beater. 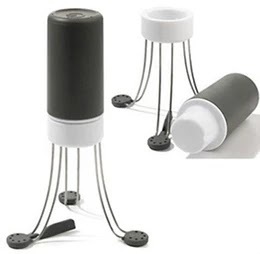 Whisk for about 4 minutes until they form soft peaks. With the machine still running add the sugar, 1 tablespoon of so at a time until it is all combined. Whisk for a few minutes more of high speed and once you have nice firmish peaks add the white wine vinegar and cornflour, and then whisk for a further minute more. Line a baking tray with nonstick baking paper and, using a pencil, mark out a circle 25cm (10in) in diameter in the middle. 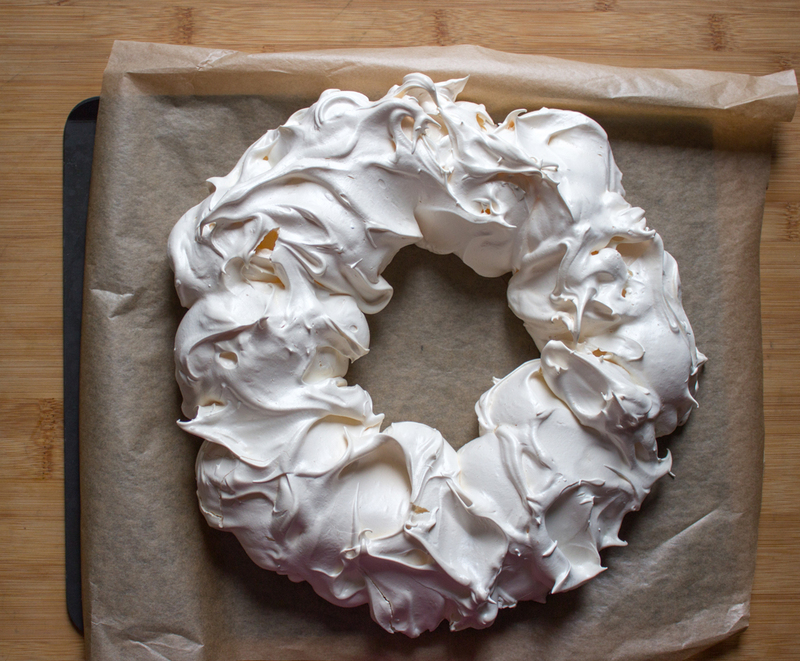 Spoon large, equal dollops of the meringue mix along the inside of the circle line to form a wreath shape. Put the meringue in the oven and immediately reduce the temperature to Gas 1/140°C or Fan 120°C. Cook for 1 hour 15 minutes, then turn off the oven and leave the wreath in there to cool completely. Once it is cold you can remove it from the oven if you need to - just carefully cover the meringue with clingfilm and leave it overnight. Carefully peel off the baking paper and transfer to a serving platter. If a little crack appears fear not as you can disguise it with the cream and berries 😉 if you look carefully you'll see a little bit of mine actually broke off but not to worry. 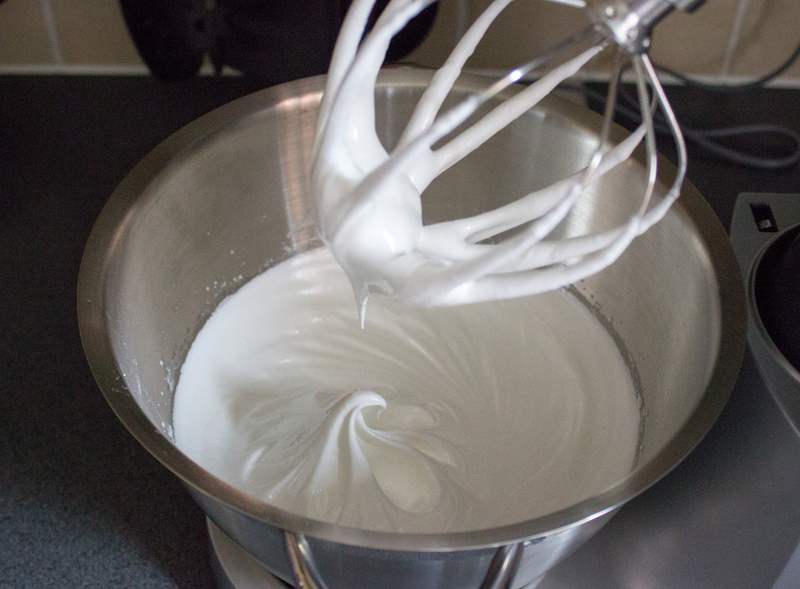 In a clean bowl using the whisk attachment, whip the cream, sugar and vanilla extract until soft and thick. Melt the chocolate in a heatproof bowl over a pan of simmering water. Stir the chocolate until completely melted. Now spoon the whipped cream over the wreath and add the berries. Drizzle the chocolate over by spooning chocolate onto a fork and using a left to right motion to drizzle over the meringue and berries. Of course you don't have to make this for Christmas - you can make one anytime you're stuck for an easy dessert. Try alternating the berries to fit the season or how about white chocolate or even using salted caramel chocolate - now there's a thought. that looks so impressive, must do that next time I'm entertaining guests. It sounds so simple!